Version 3.0. The main site has been upgraded with a very high-performance dual-processor server in addition to all the others. Nevertheless, if you are having trouble, try www.electoral-vote3,com, electoral-vote4.com, etc. Curious about who the Votemaster is and why he created this site? Meet the Votemaster. There was another attack this morning and that took some time to deal with. Remember that if the site is unreachable, try the backup sites: www.electoral-vote3.com through www.electoral-vote8.com. I will also update the site tonight as the actual results come in. Furthermore I will also do a post-mortem on the election in the coming days, so check back later in the week. My special interest is how well the pollsters did. To see the current predictions broken down by pollster, see the Pollsters page and the pages for the battleground states, many of which have separate graphs per pollster. Now let's start with the pre-mortem. Another bumper crop of polls, 47 in all. Five states changed since yesterday. A University of New Hampshire poll breaks the tie there and gives Kerry a 1% edge in New Hampshire 49% to 48%. According to Zogby, Kerry is also edging ahead in New Mexico, 51% to 48%. Now come some controversial polls. Yesterday we had Kerry ahead in Ohio on the strength of a Gallup poll showing him 7% ahead there. Today we have a new Fox News/Opinion Dynamics poll showing Kerry 3% ahead there Please don't send e-mail telling me what you think of Fox news. I'm pretty good at guessing, but I am trying very hard to be impartial. Tomorrow we'll know. Similarly, in Wisconsin a Fox News/Opinion Dynamics poll shows Kerry's 7% lead has vanished overnight and been replaced by Bush's 3% lead. Again, PLEASE no e-mail about this. Instead, come back tomorrow for the post-mortem. If you don't buy these numbers, add 30 to Kerry and subtract 30 from Bush to get Kerry 292, Bush 231. Finally, Strategic Visionn (R) says New Jersey is a tie. Yesterday I had an Eagleton-Rutgers poll showing Kerry up by 8% and today there was a Quinnipiac University poll showing Kerry ahead by 5% in New Jersey. But the rule still holds: most recent poll wins, and that is Strategic Vision. If you don't like this result, award Kerry another 15 electoral. 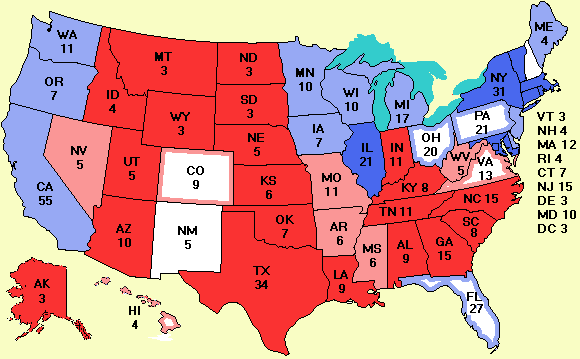 Zogby has polled Bush's job approval/disapproval rating in several states. This is often a key indicator of how an incumbent will do in his reelection campaign. An approval score substantially below 50% is indicates trouble ahead. Here are the approval/disapproval scores in some key states. Colorado 46%/54%, Florida 46%/53%, Iowa 45%/55%, Minnesota 43%/56%, New Mexico 47%/53%, Nevada 49%/51%, Ohio 43%/49%, Pennsylvania 445/55% and Wisconsin 45%/55%. SCOTUS news: Chief Justice William H. Rehnquist announced last week that he was going to return to the Supreme Court yesterday. He did not return. According to the New York Times his office released a terse statement saying that the Chief Justice spent 7 days at Bethesda Naval Hospital where he was treated for thyroid cancer. He underwent a tracheotomy so he could breathe and he is now being given both chemotherapy and radiation treatment. Medical experts say this evidence suggests that the cancer was not successfully removed and that even with heroic treatment, patients with this type of cancer usually die within a year. Should the election end up in the Supreme Court, it is not known whether Rehnquist will particpate in the case and vote on the outcome. Should he decline to participate due to ill health, the deadlock in the country might end up in a Court itself deadlocked 4-4. In such an event, the lower court ruling stands but no legal precedent is set. An alternative scenario is that Chief Justice Rehnquist resigns and that President Bush makes a recess appointment, which does not require Senate confirmation. If Bush were to appoint a new justice without Senate confirmation who then cast the deciding vote to make Bush president I fear for the future of the country. Let us hope somebody wins big today with no litigation. Do your part and vote. The site was subjected to another massive attack yesterday. I would like to take this opportunity to thank the attackers. We hit the jackpot yesterday. On Sunday, 675,000 people visited the site, and typically traffic on Mondays is much higher than Sundays. Unfortunately, the site doing the real-time monitoring couldn't handle the load and gave up. On top of this, electoral-vote.com was mentioned on the main page of slashdot.com, a hugely popular tech news site. The last time I was slashdotted, I got 700,000 hits. That incident was caused by the publication of a book emitted by a Microsoft-funded think tank in D.C. claiming that Linus Torvalds stole Linux from my earlier MINIX system. I posted a vigorous and caustic rebuttal saying that the book was utter and complete nonsense. My role was that of Linus' teacher, not his coauthor. Either the impending election or the slashdotting would have driven most servers into the ground. Now throw in a massive distributed denial of service attack on the main server and the backups and you can see why the site was a tad slow yesterday. I must have called the technical staff at my hosting company, HostRocket.com 10 times yesterday. At one point I was tempted to say: "How many 2-GB Pentium 4's do you have left and can I have them all?" Ultimately I took only one more, but with help from some kind-hearted colleagues, I got mirrors up and running from Boston to San Diego. So why am I a happy camper? We survived an unprecedented triple flash crowd and logged it all. As it turns out, two of the faculty members in my Dept., Maarten van Steen and Guillaume Pierre, are doing research on coping with flash crowds. The research issues include how many replicas to set up, where to place them, how fast to deploy them, and how to do it automatically, in real time, and at minimum cost. To simulate proposed algorithms, you need data about real flash crowds and real attacks, preferably at the same time. And boy oh boy do we have data now. Students interested in this and other areas of computer systems might want to check out the English-language Masters program I am running at the Vrije Universiteit. Check back later for more info, tonight for real-time updates, and tomorrow for a post-mortem. This site has far more about the election than just the map. See the Welcome page for more details.